Norway offers the perfect environment for EV deployment. Large tax breaks, expensive gasoline and several additional perks have allowed EVs to capture more than 10% of the market. Debate about this highly favourable policy environment is heating up and presents an interesting test case to follow over coming years. Norway is EV heaven. It has the highest gasoline prices in the world, is blessed with an abundance of cheap and clean hydroelectricity, boasts a rich and fairly environmentally conscious population, has a landscape that encourages flying over driving for medium-distance travelling, and is run by a highly influential government that still enjoys the trust of the people. All of these factors combine to make Norway arguably the single best place on Earth to deploy EVs. And it shows. 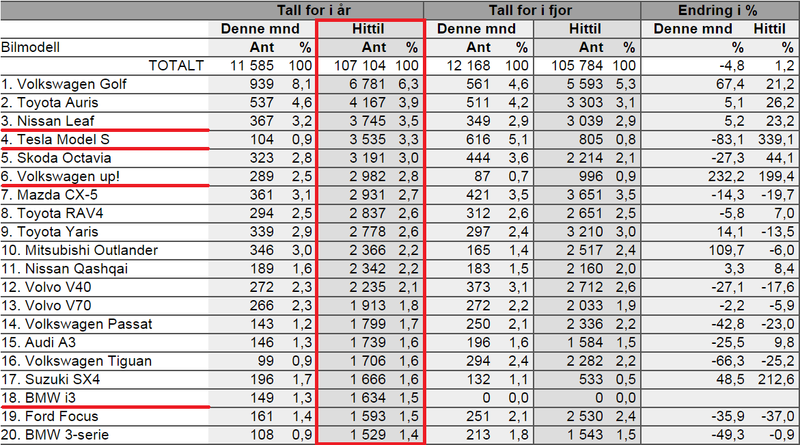 Norway now has four EVs in the top 20 sales list for 2014 to date (underlined in red below). The new e-golf is also just hitting the market and is expected to be a huge success. Overall, zero-emission vehicles captured 11.2% of the market in September. So, what does it take to get numbers like the ones above? This article will take a closer look. The first and most obvious requirement of high EV market penetration is very large reductions in the purchase price. Norway imposes very large taxes on new cars and EVs are exempt from essentially all of these taxes. In addition, EVs receive very large CO2 reduction tax breaks (equivalent to about $1000/ton). The sum-total of this is that EV prices in Norway are roughly 45-65% of what they would have been without tax breaks, allowing them to reach sales prices that are similar or lower than that of comparative gasoline-powered vehicles. Tesla has been a particularly large beneficiary of this system because Norwegian taxes on heavy and powerful cars really become quite enormous. For example, the Tesla P85 goes for about 600000 kroner ($94000) and avoids taxes of about 740000 kroner ($116000). This 55% discount has allowed Tesla to burst on to the scene, even beating the Nissan Leaf up to August this year. Tesla sales are losing steam as the fairly small target market is getting saturated, however, and have just been overtaken by Nissan. Norway has the most expensive gasoline on the planet, topping the list at $9.79/gal. Current international oil prices result in gas prices of about $2.50/gal, implying that Norwegian taxes almost quadruples the gas price. In addition, Norway can easily produce all the oil it needs for a fraction of the international oil price. Although oil production in Norway has entered a seemingly terminal decline, the country still produces 8 times that which is needed for domestic consumption (BP Statistical Review). 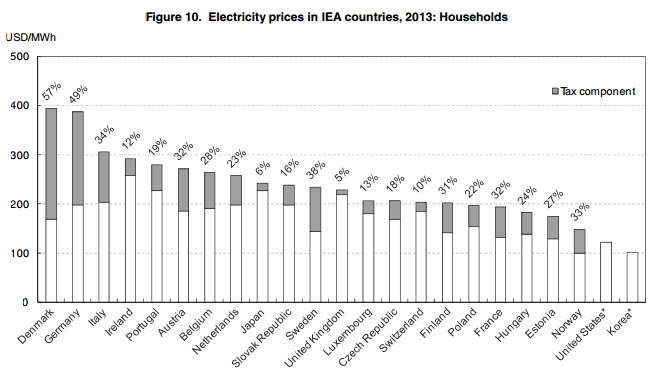 On the electricity side, Norway’s hydropower blessing results in some of the lowest electricity prices within the developed world (see below). Furthermore, EVs can charge for free at any of the numerous charging stations which have been built in Norwegian cities. Assuming that the average EV gets half of its electricity from these free stations, EV fuel costs would be about 10 times cheaper than that of a conventional car. Of course, if free charging was removed and EV electricity was taxed similarly to gasoline, this cost difference would be almost eliminated. And if gasoline were priced locally like electricity (priced according to the actual cost of production), gas-powered cars would actually be cheaper to fuel than EVs. EVs enjoy many advantages in Norway. They can drive in the bus lanes which makes rush hour commuting a breeze, they are exempt from tolls, ferry costs and parking fees (which is quite a big deal in Norway), and they are almost exempt from the annual vehicle duty (another tax). Access to bus lanes is the first perk that will soon have to go as EVs are now starting to impede bus traffic transit during rush hour. With EV sales prices now on par with those of regular vehicles in Norway, it is somewhat surprising that they are not significantly outperforming regular vehicles in terms of sales. After all, fuel costs are a lot less and various additional perks bring further savings and conveniences. However, aside from the short range and long charging times still hampering EVs, there are also serious questions about depreciation. This article calculates that, for a given sales price, the cost of owning an EV would be similar to that of owning a regular vehicle if the EV loses its value over 5 years. This could conceivably happen if the battery shows significant degradation and some of the EV perks mentioned above fall away during this time. Is Norway doing the right thing? There is no doubt that the very large government incentives are effectively putting a large number of EVs on Norwegian roads. Are these large incentives a good investment? Personally, I am quite torn on this issue. On the one hand, EVs running on hydropower are substantially more environmentally friendly than regular vehicles. Electrification of the Norwegian vehicle fleet would also secure Norway’s energy future when the oil finally runs out and slightly reduce international oil demand. On the other had, there are many more cost-effective ways in which Norway can use its enormous oil-derived wealth to benefit the environment. Norway will also produce enormous oil & gas surpluses for many decades into the future, implying that energy security is not really a priority. Reductions in Norwegian oil demand will also have an essentially negligible effect on global oil prices. Another argument is that Norway might be (to a limited extent) doing for EVs what Germany did for solar panels – help to drive down costs. However, solar PV is currently demonstrating the dangers of such a scenario where solar optimism is diverting a disproportionate amount of investment capital away from potentially more effective solutions with very little real impact. EVs can have similar unintended consequences (e.g. EVs would result in more CO2 emissions than efficient ICE vehicles in the largest global car markets as shown below). As more EVs hit the road, this debate is heating up in the Norwegian media. What is your opinion?